A new school year is upon us, and with it comes much anticipation for new learning adventures. For many teachers, those adventures include the increasing availability of technology to help transform your classroom. What frequently comes next is the big question, “How do I manage a room full of kids with devices?” Too often, teachers begin to adopt a “restrict and conquer” policy in an effort to maintain control over how and when students are accessing digital content. The focus becomes more about the device, when what we are ultimately managing are our students. A common perception can be that managing a digital classroom requires a whole new approach to be effective. However, I’ve found that many traditional methods of classroom management transfer successfully in a technology-rich environment – with a few adjustments. Here are five simple tips that will help lay a foundation for success. 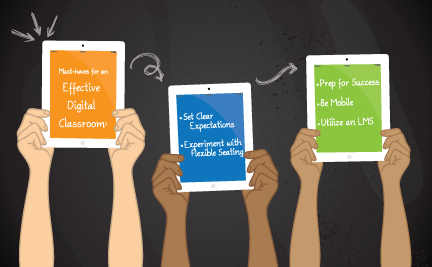 From Day 1, ensure your students understand the expectations for appropriate technology use. Involve them in the process of developing house rules, and consider what the consequences will be for violations. Why not allow students to generate digital posters of the newly adopted expectations and let the class vote on a favorite? In a BYOD environment, display a sign that indicates if students will be using devices that day (and yes, it’s okay NOT to use devices!) When students are not using devices, consider the practice of placing them face down on the desk. This removes the temptation to sneak a peek at Facebook under the table. Don’t forget – consistency is king! Why does this help with classroom management, you ask? Engaged kids are much less likely to become distracted and off-task. Create workspaces that support creative collaboration. This might look like a collection of bean bags around a coffee table or a circular pattern of desks with you as the nucleus. Try different arrangements to determine what becomes most conducive to engaged activity. Gone are the days of perfectly arranged arrays of desks. Mix it up! Nothing discourages distractions more than a well-planned lesson where kids are consistently required to participate. As previously noted, engagement is key! Thorough preparation becomes even more vital when you introduce the digital element. A well-paced lesson that integrates technology effectively not only provides students with a richer learning experience, but it encourages them to remain focused on using the tech for all the right reasons. Invite them into the lesson by contributing to a backchannel using TodaysMeet or by using Chirp to share an image as a writing prompt. As you wrap up, share a blank Google slide and have groups of students design five word stories that summarize their learning for the day. Just remember that part of being prepared means you are prepared with a Plan B. Even if the technology fails, you can press on like a pro. Perhaps one of the biggest shifts that occur for educators when introducing technology is that you can no longer remain behind the desk. Moving around the room and being in close proximity with your students allows you to more closely observe how they are using the technology to help drive their learning. It is one of the best ways to deter off-task behavior, and it allows you to more quickly respond to those who may need a little extra help navigating an app or connecting to digital content. If a student is hitting the sleep button or double-tapping home as you approach their work area, take time to address the concern and have discussions about appropriate use. This communicates to the entire class that you are there to support good work habits. Access to content is crucial when it comes to integrating technology. Leveraging the power of a learning management system allows you to centralize online educational activity while supporting a collaborative digital environment for your students. By streamlining the process of sharing content, generating discussions, and assessing learning, you reduce down time and keep students engaged. Here at eTechCampus, we are excited to launch Converge. This dynamic LMS enhances the power of Moodle to bring you an intuitive user experience, allowing schools and organizations the ability to easily manage, monitor, connect, and innovate. Don’t miss this opportunity to involve your school or district in an LMS that was truly designed with the teacher in mind. Ultimately, good classroom management is a process and is often shaped by the dynamics of your students. Experiment with these five tips and don’t be afraid to try something new! Previous PostPut Away the Construction Paper! Next PostNeed A Creative Thinking Boost? Get in here!